"The Zookeeper's Wife" begins in Warsaw, Poland in 1939, and tells a little-known story of a couple who own and operate the city zoo, and use the facilities to hide Jewish prisoners and refugees. The zoo turned into the first stop on an underground railroad to safety, saving the lives of at least 300 people. The story opens on a beautiful day in late August, and establishes the family's love of nature and their animals. September 1, 1939 changes everything, as bombs fall, and many of the animals escape, only to be shot later. The scenes of camels, lions and zebras roaming the city add to the sense of dread. Jessica Chastain takes the lead role, with Johan Heldenbergh as her husband. Daniel Brühl plays the villain, the head of the Berlin zoo - who takes the zoo's best animals and kills the others. He plans to use the Warsaw zoo to breed an ancient species of oxen. He also had his eye on Chastain, who encourages his attention to gain favor. 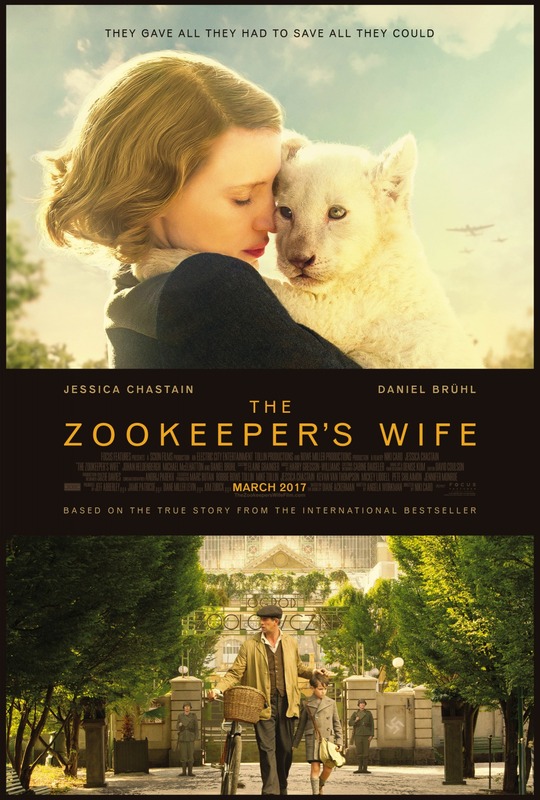 "The Zookeeper's Wife" echoes other Nazi dramas, but doesn't improve on them. The filmmakers appears to pull their punches, polishing up the truth to make the film more acceptable to moviegoers. Most of the cast comes from Europe, with the exception of Chastain. Her attempt at a Polish accent detracts from the story. The script feels slow and long. The acting is wooden and melodramatic. The result is uneven. 2 stars, rated PG 13. Does it deliver what it promises? Holocaust story. Is it entertaining? Slow and wooden. Is it worth the price of admission? Sadly not.